Despite punishing weather that had not been seen on Patriots Day for 30+ years, all 19 of the Joe Andruzzi Foundation’s “Team JAF” Boston Marathon runners crossed the Boylston Street finish line on Marathon Monday – a feat that perfectly captured the spirit, commitment, and determination the team had exuded throughout its training season leading up to the race. The team members – mostly made up of runners receiving John Hancock Non-Profit Program Boston Marathon bibs – each dedicated their winter and early-spring towards a singular goal: to raise crucial funds in support of the Joe Andruzzi Foundation’s mission of providing help, hope, and a reason to smile, for New England cancer patients and their families by providing financial assistance when it is needed most. There are so many individuals and organizations we need to thank, but, of course, it all starts with the runners. From the bottom of our hearts, thank you Melissa Angelini, Jessica Colangelo, James English, Maura Healey, Jillian Hillman, Alexandra Kay, Matthew Kelly, Erin Kilduff, Robert Lalor, Stephanie Magni, Alexandra Pepe, Amy Pepe, Stephanie Riley, Dave Roche, Joseph Roche, David Santoro, Michelle Tsimtsos, Ryan Wendell, and Christine Woods. To date, these 19 Team JAF runners have raised more than $175,000 through the 2018 Boston Marathon, which will empower the Foundation to provide hundreds of new grants to cancer patients and families across New England in the months to come. Needless to say, we could not be prouder of their accomplishments. Each year, we are in awe of the grit and passion that drives Team JAF runners dating all the way back to our inaugural Boston Marathon team in 2011. It’s hard to comprehend just how far we’ve come over that period – all because of the incredible network of runners and supporters who have donned the Team JAF singlet in support of the cancer patients JAF serves. Because of their selflessness and generosity, our all-time Boston Marathon fundraising is nearing $1.6 million! As has become tradition, members of Team JAF and Foundation supporters and staff invaded Boston for an entire weekend chalked full of Marathon programming, starting with Saturday morning’s BAA 5K and our annual Team JAF Pasta Dinner later that night. At the dinner, Team JAF runners and their family/friends had an opportunity to mingle and reflect on month of training before hearing from former Joe Andruzzi Foundation grant recipient, Tanya Sexton, who shared her cancer journey with the team and stressed the importance of the funds they had raised in support of patients like herself. “Know when you are out there on Monday – Mile 6, 16, or 26 – that you represent a foundation that truly changes lives,” she told the team. Hardware was also given out at the dinner, including acknowledgement of Team JAF’s top fundraiser (Michelle Tsimtsos); the annual Team JAF Spirit Award, which is given annually to the runner who best represents an (Up)Beat attitude and dedication to JAF’s mission throughout Marathon season (Dave Roche); and the Unsung Hero Award, presented to the Team JAF runner who best displays passion, perseverance and determination throughout Marathon season (Stephanie Magni). 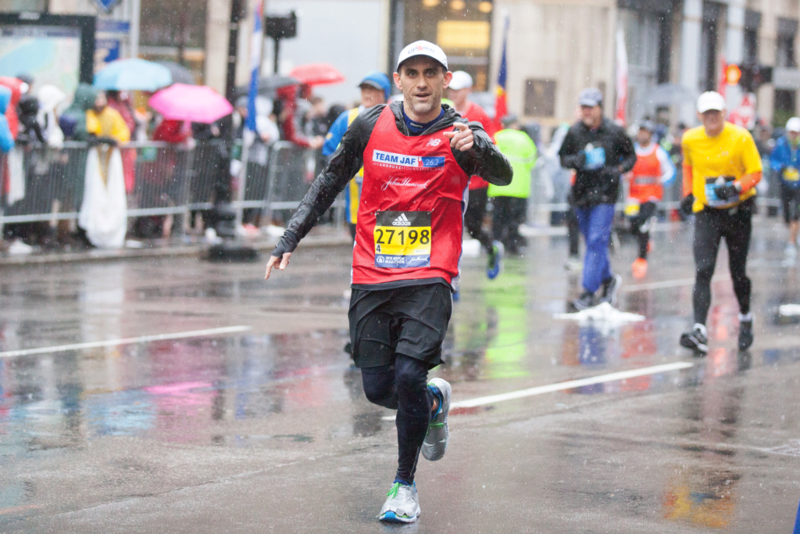 It’s impossible to fully capture the feelings of gratitude we have for so many friends and supporters who helped make JAF’s 2018 Boston Marathon campaign such a success. Of course (and as previously mentioned), the runners, but also the families, friends, and donors who have supported each of their campaigns over the last few months. The John Hancock Non-Profit Program, which helped make Marathon Monday possible and allowed us to take our Team JAF roster to new heights. Susan Hurley of CharityTeams, who once again led an incredibly successful Boston Marathon campaign for Team JAF. As our team captain, Susan always puts Team JAF runners in a position to succeed through training and fundraising – and she continues to be a model ambassador for the Joe Andruzzi Foundation’s mission. New Balance, which once again generously designed and donated Team JAF’s 2018 Boston Marathon singlets. The Boston Athletic Association and its army of volunteers, who we are indebted-to and in true awe-of. Patients at Hasbro Children’s Hospital in Rhode Island for making each Team JAF runner a Marathon cheer sign. Davio’s Northern Italian Steakhouse for hosting and catering our Pasta Dinner Saturday night. Stacey Howard Photography for braving the elements – not just on Monday, but all marathon-season long – to capture images of our runners working towards their Marathon goals. And our friends at ALEX AND ANI, who had quite the cheer section rooting for Team JAF runners on Heartbreak Hill. If you were not able to make it to the Marathon on Monday, be on the lookout for our Facebook photo album later in the week for some amazing shots – and if you would still like to contribute to Team JAF’s 2018 Boston Marathon campaign, donations will be accepted through May 15, 2018 at http://bit.ly/teamjaf18. And, of course, we owe one last thank you to everyone who made JAF’s 2018 Boston Marathon journey such an overwhelming success. To the runners and everyone who donated to Team JAF, please know how important you are to our foundation – we couldn’t be happier to have you in our corner. We can’t wait to cheer on Team JAF again in 2019 – hopefully with a little better weather.